During my excursions in the world of podcasting, I have had the pleasure of serving on a few panels with filmmaker, musician and artist at large, Tonjia Atomic. She’s a delightful and intelligent person. So, when she sent me her latest film, PLAIN DEVIL, I reiterated my policy. Not to be overly solemn, but I am always honest in my reviews. It does not reflect how I feel about the people, but the reviews must be truthful and not swayed by familiarity or sentiment. And as we all know, the truth can hurt. I am repeating this policy for you right now because I want it made clear that my appreciation of Tonjia Atomic as a person has nothing to do with what I’m about to say about PLAIN DEVIL. And that is that it’s the funniest film I’ve seen so far this year. Lil’ Gypsy (Ada Karamanyan) has recently emigrated to America with her conservative but ever hopeful parents in order to realize her lifelong dream – to be with Mickey Rourke. Gypsy is large and awkward and thus becomes the object of ridicule for a wannabe girl gang. But it turns out the gang has its own dream – mainly, to become a real gang. Right now, they have only three members: the caffeinated and lovelorn Trashy (Danielle Daggerty), the smart and intuitive Einstein Vagein (Rachel Jackson) and gang leader Bomber Hoshi (Atomic). Einstein Vagein (a name so nice I had to write it twice) brings up that with only three members, they are technically a trio and not a gang. They need a fourth member, which they find when Gypsy and Hoshi discover their mutual love of Rourke. Hey, he does have a certain magnetism. Gypsy gets a makeover as the gang tries to think of ways to be menacing. The problem is that they really aren’t that mean when you come down to it. They have to figure out ways to toughen their image, but they don’t like smoking and if they swear any more, they’ll come off as callous. Still, what they lack in toughness, they make up for in ambition and sure enough, the Devils start to make themselves known. But just as everything seems to be coming together, something else threatens to tear them apart. 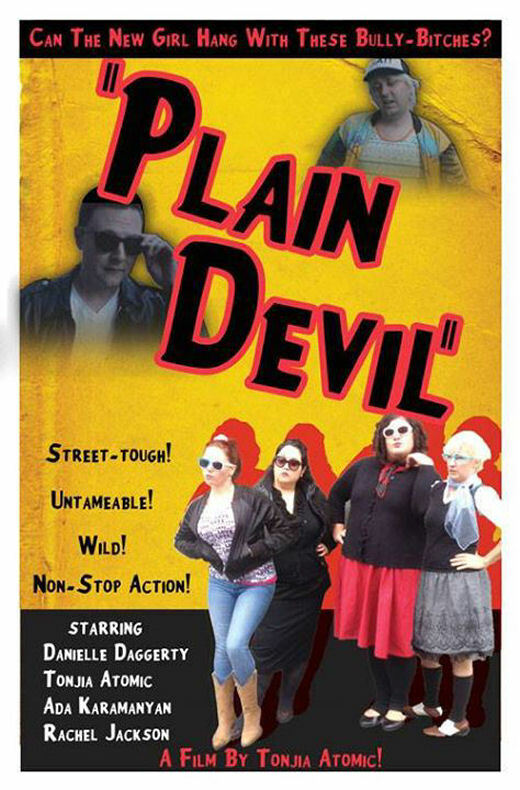 PLAIN DEVIL is about wild characters, female and male alike. It’s a topsy-turvy homage to the girl gang films of years past, but with a post-modernist edge. It even sports an exaggerated widescreen look like Nicholas Ray used in REBEL WITHOUT A CAUSE. But it’s also about the 21st century for the American dream that exists even for those who nostalgically cling to decades past. As we have been taught over the years, the American dream says that you should be able to strike out and make your mark in the world on your own terms. But in the age we live in, even the most rebellious of us also feel some need to belong. And that dream only seems to reward us when we have people to share it with. If you can imagine John Waters invading the set of MEAN GIRLS as the script was getting a once-over by some of the better writers on PARKS & RECREATION, you’ll get a general feel for the type of wonderful lunacy offered up by PLAIN DEVIL It’s the type of film where you’ll see a Christian tattoo parlor called What Would Jesus Tattoo? But that wacky in-your-face humor is immediately tempered with a great awkward bit where Hoshi learns that she’s the only one who has the stomach to get the requisite ink (“I’m the only one getting our matching tattoos?”). Atomic tends to fill her films with interesting characters, something I discovered in her earlier film, WALKING TO LINAS. But everyone is given a chance to shine so much brighter here. I’m not sure if Atomic wrote the characters to fit the actors or vice versa. But whatever she’s doing, it works. Just about everyone in Atomic’s vision of Seattle is out there in some wonderful way and they inhabit their eccentric personae endearingly. The only real problems to be found in the film are in some of the editing of the early scenes. With comedy, even a fraction of a second can be crucial and Atomic waits a bit too long on the takes, sacrificing what could have been more killer material. There’s also a few sound issues towards the climax, a side effect of shooting in an open air space, where ambient noise can be an inconvenience. These are minor quibbles, but the only complaints I can come up with. It hasn’t been too easy to make this critic smile recently. PLAIN DEVIL is so relentlessly charming and hilarious, it had me falling out of my seat. The tables turned with this one. PLAIN DEVIL is a film that made me laugh so hard, I considered seeking medical attention afterward. Highly Recommended.